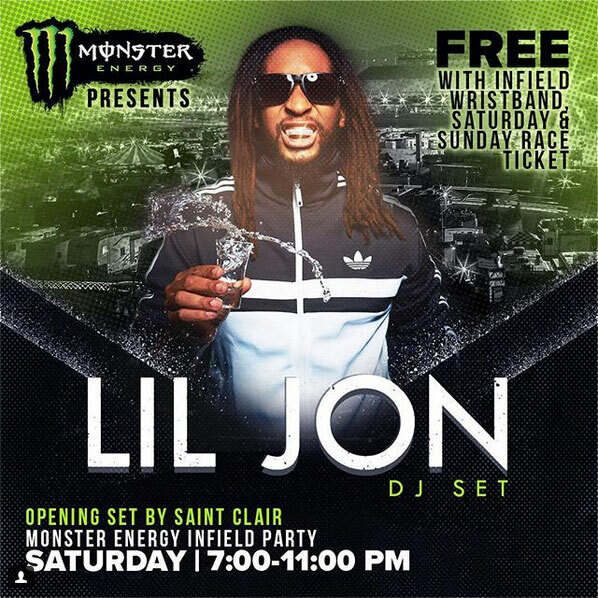 World renowned DJ Lil Jon will get the Monster Energy Infield Party in full swing during Auto Club 400 Weekend at Auto Club Speedway. 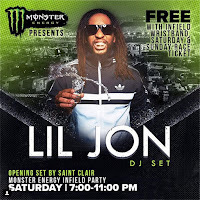 Saturday night from 7-9pm DJ Saint Clair, the former Australian television personality-turned-DJ who spins her electronic dance music in the LA-area, will warm up the crowd before Lil Jon takes stage from 9-11pm. This year’s infield entertainment is presented by Monster Energy and will take place at the Oasis, located in the Monster Energy Hospitality Area in the campground by Turn 4. Anyone with an infield wrist band or a Saturday or Sunday ticket can attend the free party. His songs have been featured in huge blockbuster movies and television shows including The Hangover, Neighbors 1 & 2, The Proposal, the Step Up franchise, FOX’s So You Think You Can Dance, Black-Ish, HBO’s Ballers, Horrible Bosses, NBC’s Parks & Recreation, The Ellen Degeneres Show, The Tonight Show with Jimmy Fallon, The Late Show with Stephen Colbert and many more. Tag Photos Using #FastestSunday and #AutoClub400.